Porcupines are just so darn adorable, but have you ever actually tried petting a real live one? We can’t recommend it. First, you actually have to find one and those little guys aren’t exactly easy to find in the wild. Then, there’s that whole OTHER issue with porcupines. They might look cute, but those quills definitely don’t feel very good, so any kind of cuddling with the little critter is risky business. The good news is that the good folks from Princess Paradise have helped us solve that little problem with this Needles the Porcupine costume for toddlers. This toddler costume is an adorable outfit that turns your child into the softest and most huggable porcupine that you’ll ever meet. The porcupine costume comes with a tunic style top made out of polyester material that's squeezable-soft. You should have no problem cuddling up to this porcupine, since the quills along the back aren’t tough spikes like the real critter’s ones. They’re soft, just like the rest of the costume. The included hood even has an adorable little porcupine face designed into it, with some cute little ears poking out of each side. The costume fits with a zipper in the front, making it easy to put on and take off. 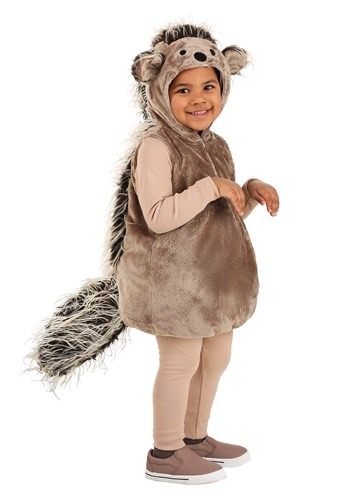 You can have your little one looking like a woodland animal in a matter of seconds. This cute little kid’s costume provides plenty of opportunities for fantastic photo moments! Just take your little one to the park and let them loose with the camera in hand to create some highly shareable moments on your social media.